The Werkstatt-Ø1: Moogfest 2014 Kit is a patchable and compact, one oscillator analog synthesizer. It was originally created as a kit, to be the foundation for exclusive “Engineering VIP” workshops at Moogfest 2014. Due to a number of requests, Moog is offering a no-soldering-required version of the Werkstatt-Ø1: Moogfest 2014 Kit. Assembly is extremely simple: Any user can quickly build an analog synthesizer based on classic Moog circuits, and if desired, study the analog circuits. Werkstatt was created to be an educational tool, but it is also a formidable, compact analog synthesizer from Moog. WerkstattWorkshop.com (beta) is Moog Music’s interactive creative learning portal containingproject ideas, mod tutorials, parts lists, educational lesson plans, 3D printer files, and everything else involved with learning and modifying your Werkstatt. 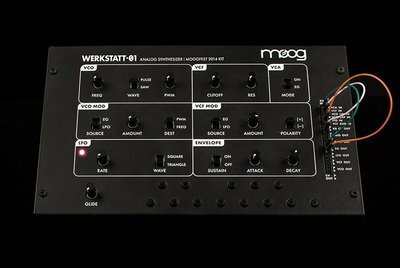 Moog Music encourages all that are interested to share their Werkstatt mods with the community by submitting them at werkstattworkshop.com. This site also features our current research and lessons surrounding the use of subtractive synthesizers in STEM and STEAM high-school classrooms. Lessons in these studies are focused on project based learning opportunities, and encouraging a creative deployment of practical skills in these fields. All lessons and associated materials are open source and available online for educators across multiple disciplines. Analog synthesizers have long had their own maker culture born of curious engineers, physicists and hobbyists who have created and crafted their sounds through electronic experimentation. It is our goal to share our love for learning, music, and electronics by encouraging everyone to create the world they want to hear, one mod at a time.